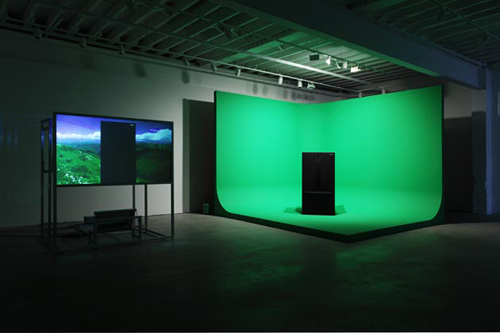 GreenScreenRefrigerator, the title work in Mark Leckey’s latest exhibition, is an ode to the hulking black mass of a Samsung refrigerator. In a rollicking twenty-minute lyric poem, Leckey addresses the Darth Vader of his kitchen: extolling it, berating it, philosophizing at it. Playing with the “greenscreen” in a series of vignettes, the stationary fridge wanders through cities, fields, and outer space on a spiritual quest for origins and answers. Leckey’s serenade to his muse, his “dark mirror,” is of a piece with his other extended dialogues with inanimate objects, especially the sculptures in his video March of the Big White Barbarians, 2005. But here Leckey dives beneath the appliance’s mute surface for a romp through its shiny insides. Nearby, the actual refrigerator looks on, from beneath a swath of green screens while another sculpture and other works further document this encounter between the artist’s dry humor and the wet and icy underworld of refrigerator coolant.